Jenny Elfsberg has recently moved to Palo Alto, California with the mission to establish Volvo Group with focus on Innovation and Collaboration in Silicon Valley. In her previous position she was Director of Volvo Construction Equipment’s (Volvo CE) Emerging Technologies organization since May 2009. Jenny and her global team of 20 research engineers worked to build knowledge and shape the future of the construction industry. Jenny has also created a framework and a network with the mission to secure Volvo CE’s innovative capability. Jenny recently moved with her family from Eskilstuna, Sweden to Palo Alto, California where she will engage Volvo Group in the ecosystem of innovation and look forward to create value for users, customers and society in an accelerated manner. Starting out at Volvo Powertrain as an Application Engineer and Leader, Jenny has worked for the Volvo Group for 19 years. During this time, she has held a variety of senior positions. Prior to above mentioned roles, she was Manager of Engine Performance Development team and before that, she was a Chief Project Manager working in components development. Married with two children, Jenny is a Swedish national and fluent in Swedish and English. 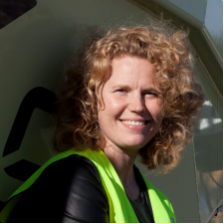 She holds a Master of Science degree in Mechanical Engineering from Linköping Technical University in Sweden and a Licentiate of Engineering degree in Innovation Engineering from Blekinge Technical University in Sweden. Outside of work, Jenny enjoys most sorts of outdoor activities, learning new things, reading and spending time with family. Elfsberg will be speaking at the IoT Tech Expo North America 2018.